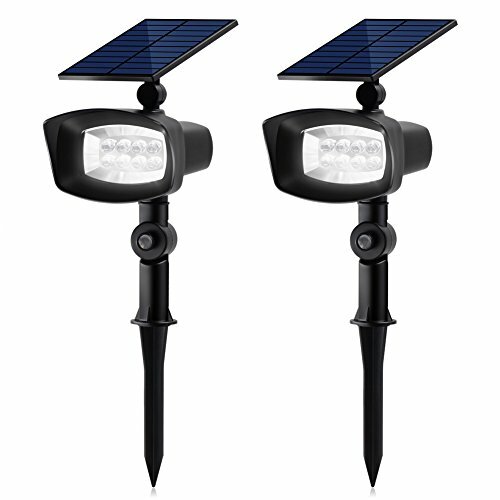 InnoGear solar spotlight with thinner and larger solar panel greatly improves the efficiency of light energy conversion, charge faster and last up to 12 hours which is much longer than other lights on the market. It's switchable between static white light and rotating through colorful light, 4 LEDs for each option. It is a gorgeous and unique addition to your landscaping and definitely gets attention. It can also be attached wall or deck railing with the provided screws and removable bracket. Waterproof and heatproof, no problems withstanding heavy rain or watering the lawn. 1. This light is switchable between white and colorful light mode. When setting in the colorful light mode, the colors are rotating through, it cannot be fixed in a specific color. 2. There are ONLY 4 LEDs turn on in each color option. 3. Please make sure to turn on the switch before use. As a solar powered product, the working time is weather sensitive. 4. Do not adjust the angles of light and panel by force, please unscrew the screw at first. Larger and thinner solar panel: 5.5V 2W panel charges much faster and stores more power than other lights. It ensures a longer working time up to 12 hours. White and rotating Colorful light: unlike other with only white Color, it has 2 modes: 1. Static white Color; 2. Rotating through Colorful light. 4 LEDs for each option. 2 Brightness Levels: Switchable between strong and dim light, 200 Lumens, up to Auto turns on at night / auto turns off at sunrise. Position them on your path which provide max-brightness illumination on your path in beauty AND safety. 2-in-1 installation: stick into the ground with included stake/ attach to wall or deck railing with the provided screws and removable bracket. Rugged and durable: it is waterproof and heatproof, no problems withstanding heavy rain or watering the lawn.